The Taoiseach told RTÉ about why he’s voting ‘Yes’. 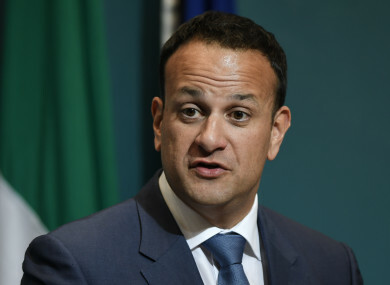 TAOISEACH LEO VARADKAR has said that if there’s a ‘No’ vote on Friday that “it’s only a matter of time” before a woman dies because of taking abortion pills unsupervised. Addressing concerns that some women could use mental health provisions in the draft legislation to terminate a pregnancy beyond 12 weeks, Varadkar says he trusts women in Ireland not to do that. “I think people who hold that view have a very low opinion of women,” he told RTÉ’s Today with Sean O’Rourke. There’s just a week left until Ireland will vote on whether to repeal or retain the Eighth Amendment, which equates the right to life of the unborn to the right to life of the mother. The referendum has given rise to a deeply divisive debate, with posters being ripped down, arguments over how both campaigns are funded, as well as accusations of the manipulation of figures and statistics during broadcasted debates. The Taoiseach answered questions on the Eighth Amendment this morning, including whether there would be abortion clinics in the event of a ‘Yes’ result; on the provision of abortion on mental health grounds; and on his treatment of women with crisis pregnancies while he practiced as a GP. He said that “the case that we’re making is that the Eighth Amendment has failed” and that “we thought that it would save lives, that it would stop abortion – but it hasn’t”. Our main case is that this is a reality… we should accept that and regulate it. He said that if there is a ‘Yes’ vote, it won’t be the case that women can demand abortion pills. There will be restrictions. So if you’re facing a crisis pregnancy, the first thing you’ll do is go to your doctor. Your doctor will be able to offer you alternatives, offer you counselling, there will be a 72 hour pause or waiting period for reflection, which doesn’t exist for example in the United Kingdom. When asked about if he was treating a woman with a crisis pregnancy, would he view that situation as treating one or two patients, Varadkar said that when he was a GP he did treat women in crisis pregnancies. The patient that you’re dealing with is the patient that is in front of you. I do think there is a difference when the foetus reaches viability, 50% of early pregnancies miscarry and that’s a natural phenomenon. He said that voting ‘Yes’ “doesn’t mean you think abortion is a good thing”, adding that “I doubt that anyone thinks it’s a good thing”. Varadkar said that if the Eighth Amendment is retained in the Constitution, it was only a matter of time before someone died after taking an abortion pill at home unsupervised. Let’s not wait for this to happen. If there is a No vote on Friday, I think it’s only a matter of time before someone haemorrhages or bleeds to death after taking one of these pills unregulated. It’s currently estimated that around three Irish women take abortion pills everyday. He said that there wouldn’t be abortion clinics in Ireland, but that hospitals would apply for licenses to carry out the procedures. There will be a licensing regime so really only hospitals will carry out surgical procedures. There’s no provision for abortion clinics in the draft legislation. He said that the plan is “to limit the number of surgical abortions” adding that because women have to travel to the UK for abortions at the moment, that they are having terminations at later stages in the pregnancy, meaning they can’t have a medical abortion (or take an abortion pill). Today with Sean O’Rourke said they would be speaking to the ‘No’ side on Monday. Email “Leo Varadkar: It's 'only a matter of time' before a woman dies after taking abortion pills unsupervised”. Feedback on “Leo Varadkar: It's 'only a matter of time' before a woman dies after taking abortion pills unsupervised”.